A married couple, both professional Graphic Designers, desire a modern light-filled addition to their mid-century brick home in Richmond's leafy Sleepy Hollow neighborhood. 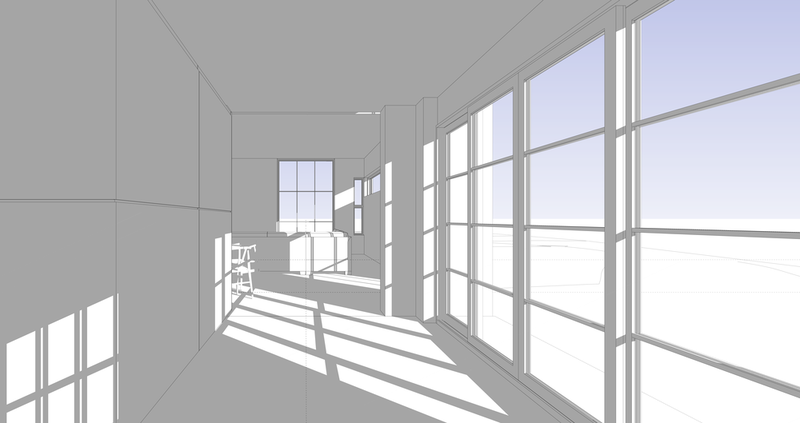 An existing rear screened porch will be enclosed with glass, and become a "hyphen" between the house and new addition. Within this hyphen is a core of storage millwork, to enable the addition to be open and free of clutter. While the existing mid-century ranch house is low and horizontal, the addition is a vertical and spacious counterpoint, and also expands onto a new cedar framed screened porch to engage the back yard landscape.